The locality is situated north of Road No. 1 and the Mitspe Yericho settlement, in a channel of Wadi Qilt, and comprises two main clusters. The northern cluster is located close to the E’in Al-Qilt spring; the distance between the southern cluster and the spring is approximately three kilometers. The community arrived there in 1964, after leaving the Tel Arad area in the 1940s; they subsequently remained for a number of years in the Hebron area and the Judean desert. Since arriving at Wadi Qilt, they have become permanent residents there, abandoning the nomadic lifestyle. There are three stone buildings in the clusters, built in the first years of settlement in the area, but since the occupation in 1967, all new building has been prohibited, including additions to existing structures, and buildings that were demolished have not been rebuilt. The clusters are located on private lands belonging to the Husseini family from Jerusalem, but the settlement is located within the area of the nature reserve declared in 1967, and oversight and enforcement of new building are extremely strict. Therefore, since 1967, no new houses at all were built there, and new families seeking housing must leave or crowd into existing houses. 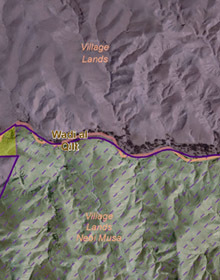 The area north of the wadi was declared under order as a closed military zone, and serves for army training, closed off to the residents and their flocks. 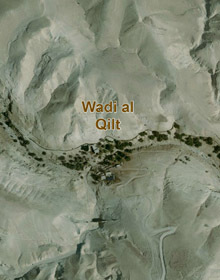 In the past, residents of the area used five active springs in Wadi Qilt as water sources, but today, only the E’in Al-Qilt spring, near the locality, is regularly accessible to the Bedouin residents, and although the water quality there has become very poor over the years, it serves as the main water source for the residents. In addition to a decrease in the grazing area and access to the water sources, shepherds there suffer from harassment and threats by residents of the nearby settlement. All of the above have led to a significant reduction in the flocks, and today, each family has only a limited number of animals for domestic use only. A number of families have been forced to split up, such that some families remained at the locality and others have moved with their flocks to grazing areas elsewhere in the West Bank. School pupils at Wadi Qilt attend school in A’qbat Jaber. Most of them remain in A’qbat Jaber during the week, staying with relatives, and return home only on weekends. Some even move completely to A’qbat Jaber during the school season. Access to the locality passes along the access road to Mitzpe Yericho and to the tourist site in Wadi Qilt. Five years ago, a metal gate was placed at the entrance, and it is closed at dark, preventing any movement of residents in and out of the locality.